Spring is just around the corner, which for brides and grooms means it’s time to start planning those smaller details. Quite an important part of the day will be the drinks reception, and the way you serve them reflects the kind of atmosphere you wish to create. Smartly dressed serving staff carrying silver trays filled with flutes of fizz suggest a highly sophisticated feel. 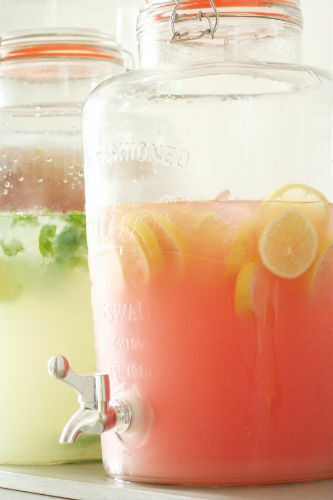 For a more relaxed affair, jars of self serve cocktails such as Pimms and Mojito, teamed with a cloudy lemonade works well. 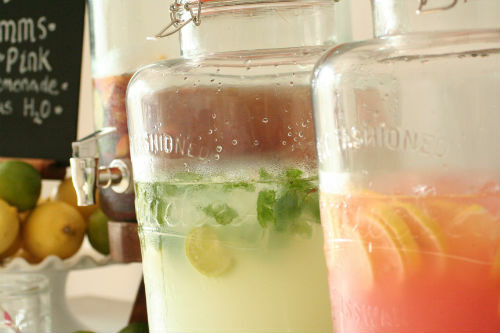 If choosing a self-serve drinks station, take some time to think about how you want it to look. Make it inviting and reflective of your style. A rustic barrel bar works well for garden party vibes, while a vintage lemonade stand adds colour and a sense of nostalgia. Add shelving, crates, furniture to the bar to create height and space for extra glasses and bottles. When day turns to night, having a fully licenced pay bar may be the way to go if you don’t wish to pay for your guests after dinner drinks. Always ensure everyone knows they will need some pennies though. If however you’re happy to pick up the tab, filling large metal baths with ice and packing them with beer and white wine, is a great way to keep everything cool without hiring in refrigeration. 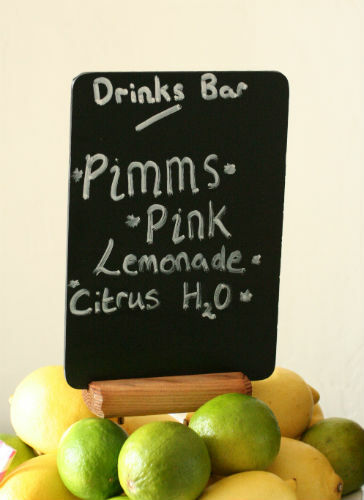 Don’t forget, every bar will need signage to tell guests what’s on offer. Light up signage works well on an evening drinks bar, adding atmosphere and style. Pintrest is absolutely stuffed full of ideas for creating a drinks area for your guests. Whether it’s cocktails or vintage classics like pink lemonade, spend a bit of time making your bar look super stylish.